This full-sized gas grill is a great value, loaded with features that make outdoor cooking easier, with better tasting results. Plus a side burner for warming side dishes and sauces. 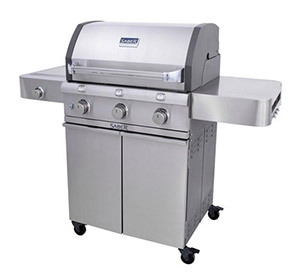 The SABER Cast 500 Gas Grill is for those who want to take grilling to the next level. West Sport in Sudbury offers everything hearth, grill and outdoor living related for your home including Malibu Hyannis Adirondak Chairs, Landman outdoor fire pits, propane tank refills, and Fire Magic built-in gas grills. West Sport SABER Cast 500 have been installed in Framingham, Natick, Lexington, Newton, Wellesley, and other towns in Massachusetts.